Invest in human talent: Hire the best and pay well. As your company grows, you must invest in the right personnel to maintain the quality of your products and services. Invest in motivation strategies so that your employees feel committed and willing to give their best. Invest in Building a Culture for Business: Policies, objectives, purpose, vision,as well as values are some of the elements that are the important part of the Business Culture. With the help of these elements the company will have a solid organizational structure,a definite approach, and will know perfectly where it is going. Invest in Corporate Image: A good logo, a powerful slogan and an integrated corporate image will help you to effectively transmit your value proposition. Invest in building an image according to the quality and values ? ?that characterize your company. Invest in Marketing: Investment in marketing has a direct impact on the income of your business and, therefore, on its growth. It is absurd to wait for good customers to come to your business because yes. You must invest in strategies of attraction and customer loyalty if you want your business to maintain a steady growth rate. 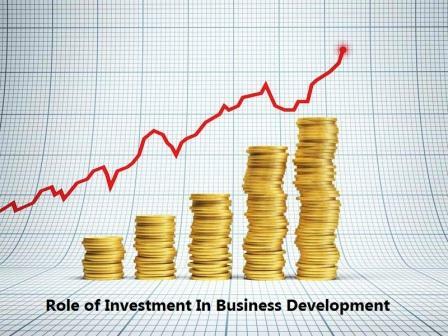 Invest in Development of your Product: For running a successful business, it is important that you must continuously improve your products. All the time you need to reinvent yourself as well as listen to the market to provide solutions that meet their needs successfully. Every day is an opportunity to improve as well as offer greater value to the customers. Invest in Training: The growth of a company must be supplemented by the personal as well as professional growth of the people who unite them. Successful entrepreneurs constantly train as well as invest in training for their employees. Invest in your Business Infrastructure: If the infrastructure of your business is key to providing a satisfying experience to the customers, then it is important that you invest in growing it physically. Whenever needed and the profit of your business allows it, invest in an infrastructure according to the needs of your business as well as the needs of your customers.